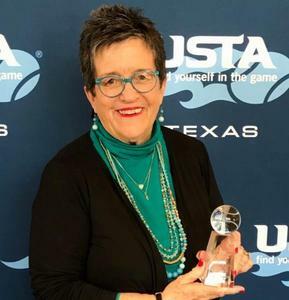 The Texas section of the US Professional Tennis Association honored HPMS teacher and tennis coach Betty Sue Welch with a Star Award at their Annual Convention Feb. 23, and nominated her for the national Star Award. USPTA Stars are members who have dedicated many years to volunteering in grassroots tennis and through initiatives incorporating multicultural and other aspects and bring the sport and sportsmanship to the players they touch. Their giving spirits have made them stars in their own communities.